Ortino’s Northside Hosts “Books in Bars” Happy Hour! 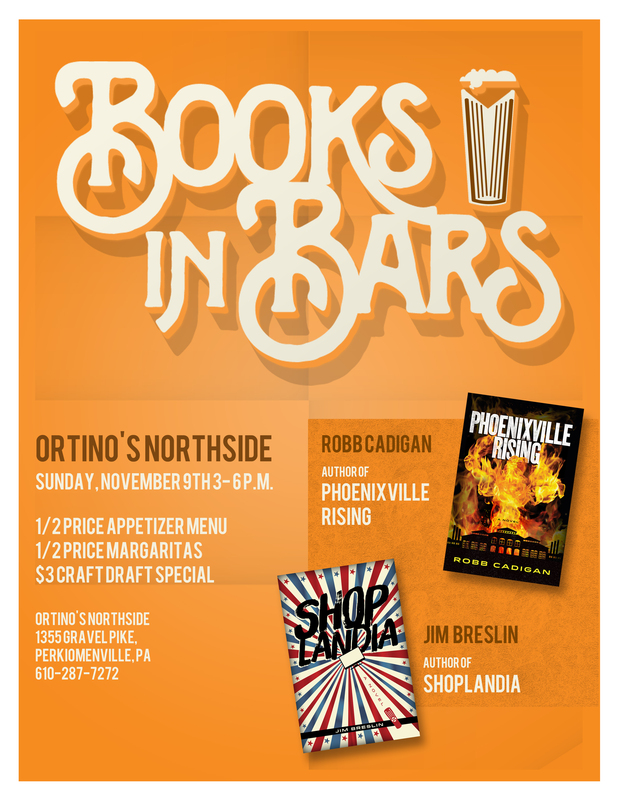 Books in Bars, an occasional series of happy hours for book lovers is being launched at Ortino’s Northside in Perkiomenville, PA, just outside of Philadelphia! “Books in Bars” is simply a happy hour for people who enjoy reading books. Think of it as a networking event for book readers – in a bar! No charge. You won’t have to listen to an author read. No highbrow literary diploma needed. Just enjoy happy hour specials while discussing books with other avid readers. Meet other book lovers and learn about their favorite books, authors, and genres. You may walk away with a larger “To Be Read” list or add to someone else’s TBR pile. Invite your book club friends, your Goodreads friends, or your local bookseller! For the Sunday, November 9th event, the Ortino family is generously offering a 1/2 price appetizer menu, 1/2 price Margaritas, and $3 Craft Draft Specials. Ortino’s Northside is located at 1355 Gravel Pike, Perkiomenville, PA. Books in Bars will run from 3pm – 6pm. Their phone number is (610)287-7272. Each Books in Bars event will feature two writers with recently published books. You can buy a book if you would like, but there is no pressure. Writers happen to enjoy talking about books in bars. On Sunday, November 9th, the writers will include two authors who live and work in Chester County. Jim Breslin is the author of SHOPLANDIA, a humorous novel inspired by his 17 years as a producer at home shopping network QVC. Holly Love wrote in the Philadelphia Inquirer, “Give me 10,000 copies. I’d gladly give it a go selling them on QVC myself.” Jim is also the founder of the West Chester Story Slam and the editor of West Chester Story Slam: Selected Stories 2010-2014. Books in Bars will be an occasional series. Possible future events are being planned in Phoenixville, West Chester, and Media. To receive email notices about upcoming Books in Bars events, click here. Also, if you are on Twitter, reach us at @BooksInBars.